It’s Here! AireBeam’s LightSpeed Broadband Internet service, our new, affordable, laser driven, gigabit fiber optic broadband service is in the early stages of availability for your home or business in Arizona City! Construction began in April, 2017. Fiber is the State of the Art in Broadband Services delivery technology! Each subscriber has a fiber optic cable coming onto their property and into their home or business, capable of carrying data at 2.25 gigabits per second! That is over one hundred (100) times faster than anything available today in Arizona City today! And customers have a choice of speeds from 50 mbps to 1,000 mbps (1 gigabit)! 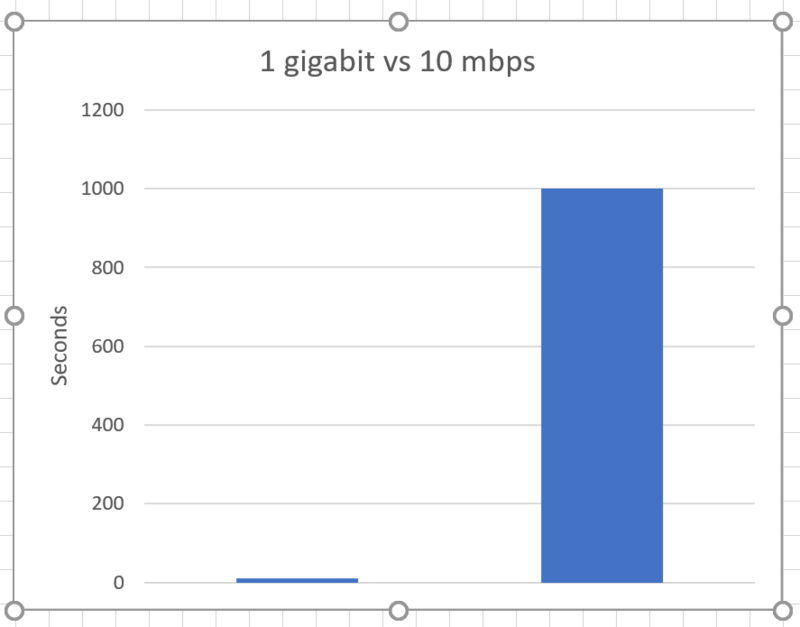 THE COLUMN ON THE RIGHT OF THE CHART IS THE TIME IT TAKES TO DOWNLOAD A FILE AT 10mbps. THE TINY COLUMN ON THE LEFT IS THE TIME IT TAKES TO DOWNLOAD THE SAME FILE AT 1 GIGABIT PER SECOND. DON'T BLINK! OUR ONT PROVIDES a GIGABIT ETHERNET hand off to your computer, switch or wireless router! NOTE: IN-HOME WIRELESS TECHNOLOGY IS CAPABLE OF A MAXIMUM SPEED OF 300 MBPS. 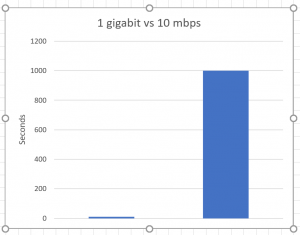 THAT'S WHY LIGHTSPEED PROVIDES an ETHERNET PORT, CAPABLE OF 1,000 MBPS (1 GIGABIT) OVER AN ETHERNET CABLE. LIGHTSPEED INSTALLS A BURIED FIBER OPTIC TRUNK LINE IN THE UTILITY RIGHTS OF WAY/EASEMENTS BEHIND OR IN FRONT OF CUSTOMER HOMES IN MOST PARTS OF ARIZONA CITY. WE THEN RUN A BURIED FIBER OPTIC DROP CABLE IN A 3" WIDE TRENCH FROM THE TRUNK LINE IN THE ALLEY TO THE SIDE OF THE CUSTOMER'S HOME, TERMINATING THE FIBER IN A SMALL EXTERIOR GRADE ENCLOSURE THAT WE INSTALL ON THE SIDE OF THE BUILDING. WE INSTALL A VIRTUALLY INVISIBLE 3MTM CLEAR TRACK AND CLEAR FIBER CABLE FROM THE POINT OF ENTRY INTO YOUR BUILDING TO THE LOCATION WHERE THE OPTICAL NETWORK TERMINAL - ONT - (LIKE A WIRELESS ROUTER) IS INSTALLED, FOLLOWING ALONG THE WALL AT THE BASEBOARD. Make Sure Your Computer Is Capable of Handling Gigabit Traffic! Customers must make certain that their computers are equipped with gigabit Ethernet ports and/or an 802.11AC wireless adapter in order to take full advantage of the ultra-fast speeds available on LightSpeed Fiber Optic broadband! The blazing speed offered by LightSpeed Fiber Optic Broadband makes it possible for you to enjoy other broadband products. Cloud DVR – No equipment needed. Record your favorite shows and series! Our goal is the make LightSpeed Fiber available to everyone in Arizona City. If you are already an AireBeam customer, AireBeam will move you to LightSpeed at no additional cost to you and your bandwidth will increase by more than 10X, depending upon your present plan. If you are a customer of any other broadband provider, have we got a deal for you! You can become a LightSpeed Fiber Optic Broadband Customer with speeds of at least 50mbps for exactly the same price that you are paying your present provider for your present speed! If you are under a term contract with the telephone company that has a termination penalty, AireBeam may agree to buy out some or all of your contract depending upon the remaining term, cost and your willingness to enter into a contact of a similar term with AireBeam! Virtually everything is available online, including groceries! LightSpeed comes with unlimited use! No data caps, so, stream all that you want! Limited Time Offer! No Term Contract! Free Installation if ordered prior to construction! Order Business Now for Free Installation!